“Cork It” by Herm has a unique product line that uses wine corks and converts them into useful and decorative objects for your home. Herm has been doing this as a hobby for over 10 years. When people asked him how they could get these for themselves or for gifts for others, he started “Cork It”. In addition to the products listed here, Herm will do custom work for you. 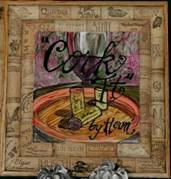 If you have corks you have saved from special occasions you can have Herm make a trivet or cork board for you. Give us a call, or send an email to Herm and tell us what you are looking for. Chances are good we have it or can make it for you. Allow 2 weeks for completion of your order.